...And those select traders will soon be making an extra £1,000, £3,000, £5,000+ each week. The question is -- will you be one of them? If you would like to pocket an extra £1,000, £3,000. 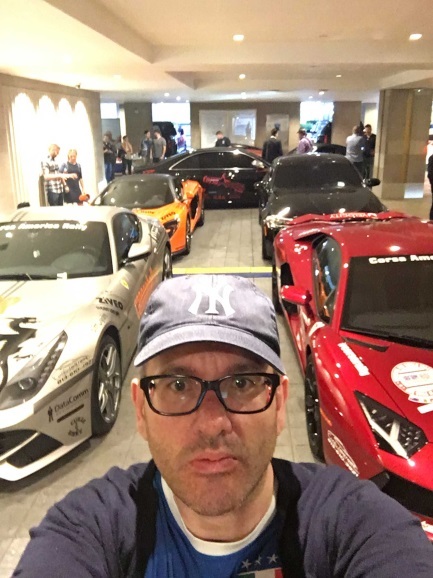 £5,000+ each week from the financial market… even if you have zero trading experience, no knowledge and virtually no time at all… then this letter will show you how you can watch and learn as I trade my personal multi-million pound trading account. I will also reveal why the Bruce Lee “JeetKune Do” principles have revolutionised my trading results and why I consistently make money regardless of the market conditions. I have made a Multi-Million fortune whilst visiting 90 countries… I have no staff… I don’t have offices… I don’t have a dress code… I do what I want with my time, I pay minimal taxes (legally) and am in great physical shape. Frankly I’ve never been happier, but this is not about me. I’m already living the dream; it’s about how YOU can do the same with nothing but a laptop and some risk capital. I don’t do meetings, I don’t speak to anyone I don’t want to, I have no red tape or have to deal with bureaucrats and I don’t have to do business with people if I don’t like them. From the outside you may say I am a social and academic drop out, yet my average earnings are very substantial and made me a multi-millionaire. Regardless of whether the market is booming or crashing I have made money. I’m proud of the money I’ve put back into good causes and the students I’ve taught to use my life-changing techniques – To be clear I’m not a training company – I’m a self-made multi-millionaire trader that teaches - not a teacher that pretends to trade on the side. There is no one else I know of that does this. The question is not WILL you make money from my trading techniques… It’s HOW MUCH you’ll make. Learn the rules that have made me a multi-millionaire and more importantly have allowed me to keep and grow my wealth and stay SANE! In the last 31 years I’ve seen plenty of people come and go, I’ve seen trading systems make spectacular gains, only to blow up. I’ve even seen hedge funds managers that were Gods with the best offices in Mayfair London, only to be closed down a few years later. I’ve survived and profited from booms and busts, and whilst some may envy me, the undisputed facts are that I’ve made a lot of money in markets, and I’m still able to. I’m still at the cutting edge today, constantly innovating, and not living on my past successes. Making £1.8 million plus a year is wonderful, having multiple homes paid in cash is great, having the toys is fun (although I walk more these days than drive) but it’s never been my goal. My number one goal was and is FINANCIAL FREEDOM, not having to sit in an office chained to a desk for 14 hours a day or reporting to some committee having to wait 50 weeks to get 2 weeks off a year. 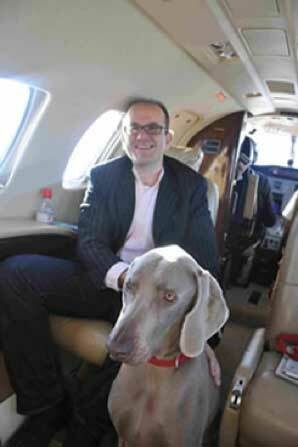 Do you know what it feels like to pick up the phone and have a private jet ready within a few hours and go wherever you like and even bring your dog in the cabin with you if you want? That’s freedom. Money also allows you to jump queues and save time… and overall you deal with nicer people. Having money knowing that you can afford the best medical care for you and your family is very important to me. The NHS does a great job but we all know it’s under pressure. 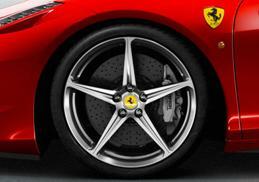 On the other hand, if you have the financial resources you simply go to the top of the list. Being sick is never pleasant but at least getting 5 star medical care and staying in a hospital which is more like a hotel makes it more bearable. My recent wisdom tooth extraction was certainly easier in a private hospital where I choose the day of the operation. 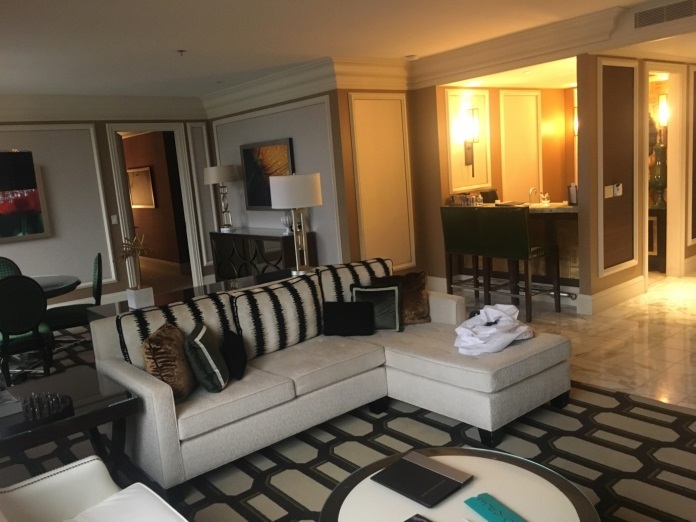 There I was sitting in Bellagio Suite 29015 when I spotted that one of my stocks had been taken over giving me a one day gain of over US$300,000. In total, my net profit on that deal was around US$810,000. Of course I was happy, but I was even happier that my members had also profited from the exact same deal – you see by sharing my research it didn’t affect my profits in anyway. If you’re wondering what the stock was, it was VCA (WOOF) and has been taken over by private company MARS. I actually shared this stock at my 2015 seminar and I’ll be sharing new ideas with you. And of course just like everything in this letter, everything I say is 100% true and verifiable. 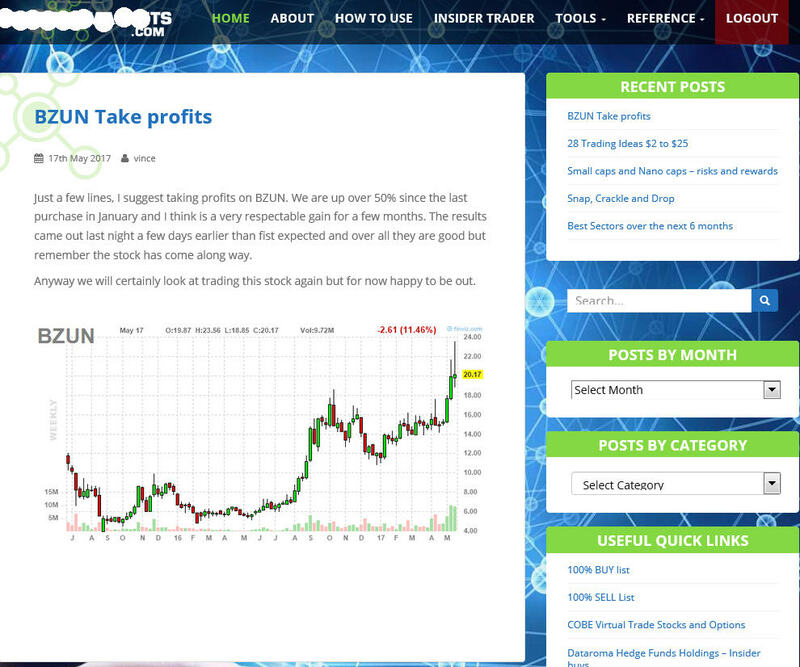 Here is the exact statement of my account and, “Yes”, that is US$810,000 profit or around £640,000 profit. But that’s the past – here’s to the future…..
On the subject of earnings, I’ve made money EVERY Year for the last 18 years in a row now. That’s through booms and busts, including the DOT COM boom and bust, the Financial & banking crisis, Greek crisis, Brexit votes and Elections to name a few. Now I don’t claim to have been right on everything, but a quick Google search will back me up that my market calls have been some of the most accurate in the industry. How to trade part-time but make a full-time living trading – I don’t want 8 screens and watching them from 7am until 9pm – I‘m not here to teach you how to get in and out of every trade and the perfect moment – life’s too short and if I can make 80% of the gain then who cares about leaving a bit behind. As I already mentioned, my lifestyle, and the fact that I can travel and trade from where I want is my big motivation. 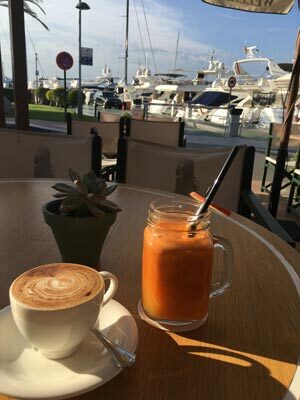 I can sit by the port in Portals Nous with a coffee; juice and my ipad using free WIFI and pull in £10,000+ a day…. I’ll share with you my exact journey from earning £100 a week to currently making over £150,000 a month spending no more than 1 hour a day. There is always a winner and a loser in financial markets and should you become part of my program, you can be part of the small but elite group that profits from opportunities like this. Of course I also make plenty from markets moving up as well. 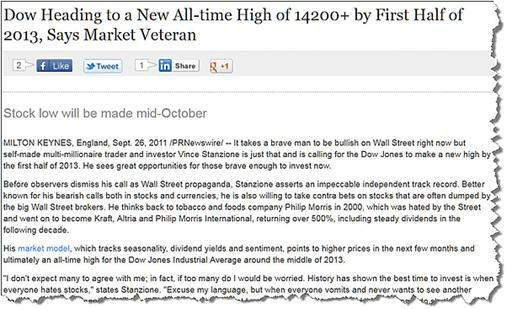 My market calls are well documented including the now famous call that the Dow Jones would hit 14200 in the first half of 2013 which I made back in September 2011 and was laughed at; of course I was proved right and in fact we went over 20,000. 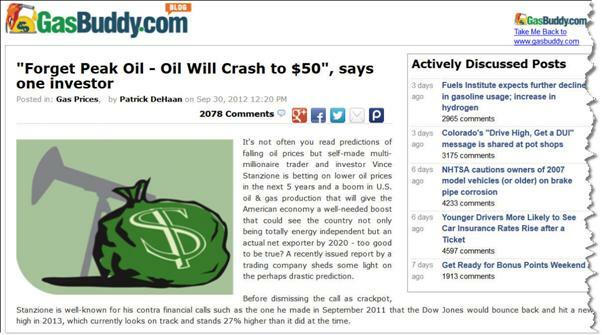 In 2012 when Oil was trading at $110 I said Oil should be nearer $50 everyone laughed and made fun of the call, I received 2078 comments nearly all negative – well at the end of 2014 oil hit $43 and I made a fortune from that call. What I show you in this letter is not to boast or impress you, but to give you an idea of what is possible. This letter is not about me, it’s about YOU and how you can build up your own fortune, and more importantly, financial freedom. 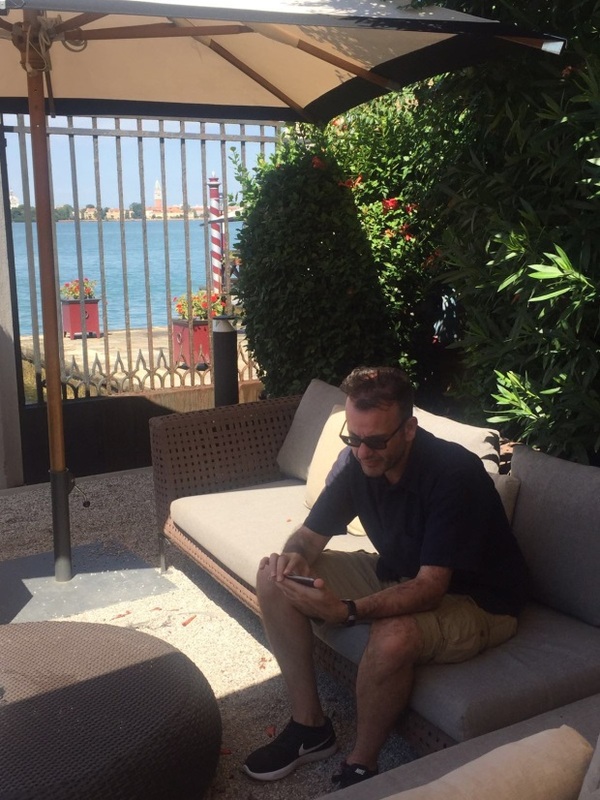 As impressive as making massive weekly gains from anywhere in the world may sound, it’s not the money that was ever important to me - it was getting the FREEDOM. As the old saying goes, “you don’t want to buy a hair growth tonic from a bald man” – and you don’t want to learn to trade and invest in financial markets from someone who has not achieved self-made multi-millionaire status. I have been in this business for over 30 years and have been featured favourably and quoted in over 200 newspapers, media outlets and websites including CNBC, Yahoo Finance, Marketwatch, Reuters.com, Independent, Sunday Independent, Observer, Guardian, The Times, Sunday Times, Daily Express, What Investments, Growth Company Investor, New York Times, Bullbearings, City Magazine, Canary Wharf, Institutional Investor China, UAE The National and Shares Magazine, just to name a few. My point is that I have not just crawled from under a rock. I am not some “here today, gone tomorrow”, quick-buck merchant. My book The Millionaire Dropout published by Wiley went straight to #4 in The New York Times Bestseller list in June 2013 for business books. The program which I am inviting to you to be part of started in 2007 and has made money every year, through what many say has been the hardest trading years in recent history. Prior to 2007, I have taught men and women from all over the globe and my personal trading account has made money every single year for the last 18 years. Of course, I have losing weeks and months, but I have never had a losing year. 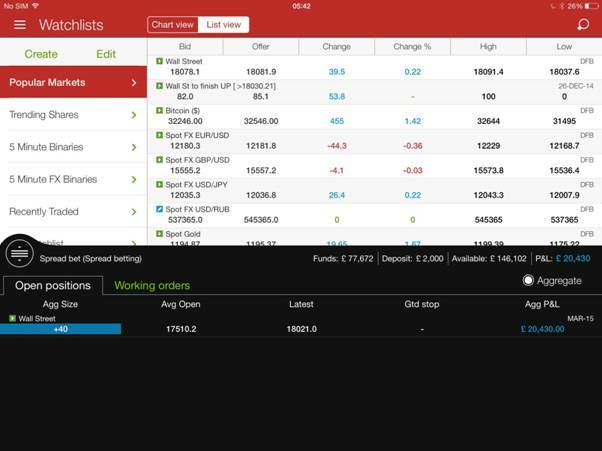 “I have had a great year and am up £230K to the 11th July when I closed 90% of my trades and went to New Zealand. I have only started back trading today, and I feel more relaxed and more confident than ever.” (Chris Muldon). 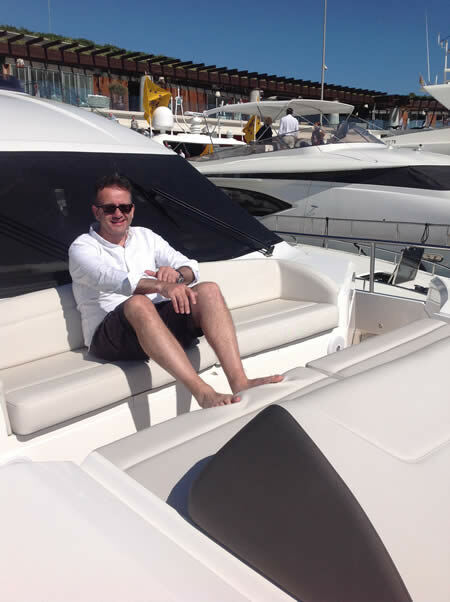 “I went from knowing little about trading at 9.30am Friday to making just over £5,000 total profit tax-free by the close of business on Monday – to say I am delighted is an understatement. Attending this event was the most profitable and rewarding thing I have ever done.” (Ajit Singh). I could go on, but I think you get the idea. 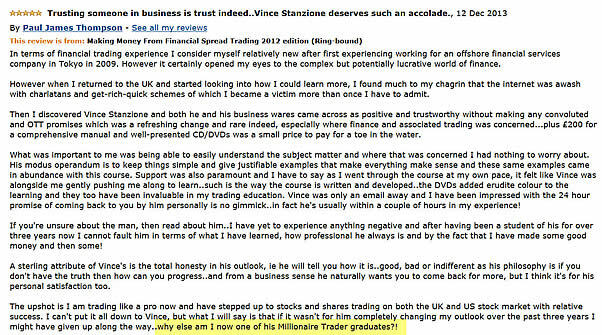 It’s important to note that none the above had trading experience before they became my students; they all came from non-investing or trading backgrounds, but were involved in professions and being business owners such as vets, dentists, doctors, accountants, florist owner, London back cab driver, farmer, BA pilot, lawyers, and even a gentleman that owns a remote salmon fish farm. I come from the school of hard knocks. I am not scared of taking the opposite view to the crowd or making hard decisions. I am not commissioned by bookmakers or brokers and I am results driven and tell you how it really is, even if sometimes you don’t want to hear it. I quickly learnt that if you do what everyone else does, you will get the same results and as 90% of traders and investors don’t make money and that includes all the so called professionals, I did not want to be with the masses. By the way, you don’t have to be based in the UK to do this (I am not) and although I have stated my earnings in Pounds, you can easily be earning the same in Euros, US$, Australian Dollars, Swiss Francs, South African Rand or any major currency. And the real beauty of what I’m going to show you today is that you can continue to make thousands a week wherever you are in the world. But before we go further let me ask you a question. Imagine – you could ask that person ANY question you liked – and they would tell you the real, bottom line truth. If you were struggling, they’d be there with their years of wisdom, experience and raw money-making know-how to show you the way. If you were lost or confused, like a close friend, your mentor would be by your side to set you straight. Yes, there are books, manuals and DVDs a-plenty. But after you’ve handed over your cash to the gurus selling their wares – all offering to teach you how to get rich − are the authors around to answer tricky questions? Or have they long vanished? The harsh truth is that virtually nobody who has made serious money is willing to make themselves available to those who are just starting on the first rung of the ladder. 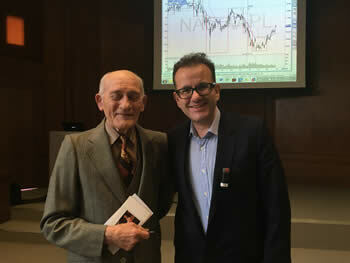 For the last 10 years, I have mentored my members personally, sharing my own trades and investments, explaining my techniques and answering questions and emails personally. Every member has my personal email details. My members also get access to my 32 years of contacts which span the globe and are able to see my own trades. Many try to complicate this business; they like to use jargon or appear important. I am sure you have seen these “gurus” on business channels, but the truth is, most of them don’t have a pot to piss in. The may manage billions of other people’s money, but they have no skin in the game. I don’t take a penny of investment capital from anyone else, I genuinely trade and invest my own account(s) and I “eat my own cooking”. And yes that is almost 16 million US$ and the current open positions are up over US$ 2 million. Would you like to be my Private Student for the next 12 months and trade alongside me from the comfort of your home? Would you like me to show you how to earn a very large INCOME from Financial Trading and trading other financial products using this system … a system which I’ve used and perfected over the last ten years and which I’ve personally used to make a personal fortune? Would you like me to be your Personal Mentor? If you do, you’ll need access to the Internet … and about 20-30 minutes spare each day to follow some simple steps. How would you like THIS job description? 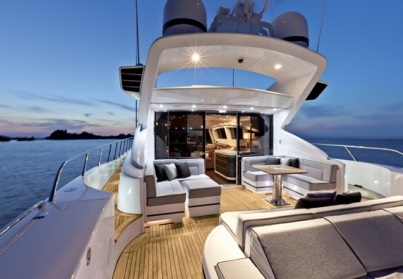 Spend Less than 30 minutes a day trading financial markets on your handheld computer from the beach or in the middle of the sea on a Yacht. My average “work week” is less than 4 hours! Yet my income puts me in the world’s richest 1%. Why work all your life in a job you don’t even like, when life could be so much more relaxing for you? Imagine the kind of incredible lifestyle that could give you and your family, a lifestyle where you no longer have to work and where you can spend most the year holidaying or travelling the world. I know it may seem amazing but I speak from personal experience. I literally do this exact thing myself. For years, we have been taught that work is something you have to do… so you can do what you really want while you are not working. I do what I want with my life. I might travel, relax, read, shop, walk with my dog (more like the dog walks me), go sailing - I guess anything I feel like, really. And I cannot begin to tell you how amazing it is to have your life handed back to you like that … to have that kind of FREEDOM … to literally be able do what YOU want when YOU want. Financial Trading gives you the ability to make more money in a month lounging around in the Maldives, than you currently make working a whole year now. As I’ve said, I have banked a multi-million fortune in the last 18 years alone from what I am about to give you the chance to use yourself. Yet, as I’ve also mentioned, it’s only taken me 20 to 30 minutes a day to do and as long as you have internet access, you can run it from virtually anywhere in the world. On a yacht in the Caribbean … sitting on a beach in the Maldives… in a luxury 5 star hotel suite in Auckland, New Zealand … ANYWHERE! 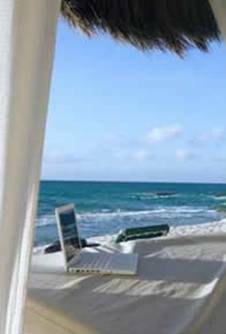 In fact, if I had been soaking up the sun on some exotic South Pacific Island for the last 12 months, as long as I had access to the Internet, I would have still banked a great income using nothing more than my computer or iPad. Take for example the time I went to Singapore. The flight to Singapore was about 13 hours long. 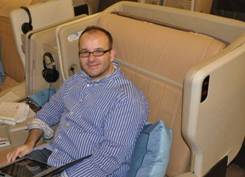 And whilst enjoying the Singapore Airlines Business Class service I watched a film… enjoyed a great meal… and… well… slept for most of the flight, thanks to the flat beds. Nothing particularly interesting about that. £21,677.00 is probably more than the pilot, co-pilot and entire cabin crew were paid for that flight... COMBINED! How would you enjoy a lifestyle which gave you that kind of freedom? Where you could literally jet-off whenever you pleased, say to the Cook Islands and then onto New Zealand … to Hawaii and then onto Mexico … yet still earn a large stress free income using just a laptop computer or iPad? (In fact, just picture the lifestyle you really want for yourself and your family right now … paying cash for the car of your dreams …for that multi million pound home … travelling the world Business, First class or on a Private Jet. Or whatever your particular dream is. And keep those pictures in mind, because I am now about to open you up to something which can provide you with exactly what it is you want. So let me immediately begin by clarifying one thing from the outset, so you can be nice and relaxed about what now follows. I want you to understand that you really do NOT need any experience whatsoever. You just need some common sense and the willingness to learn and stick to the principles. As you have likely already read my ‘Making Money From Financial Trading’ course, you have a good, basic understanding which will put you on the fast track. Through talking to many thousands of my students over the years, I’ve come to realise that people WANT to make great money on the markets BUT... they don’t want to learn a lot of complicated stuff; they don’t want to wade through textbooks or watch loads of boring DVDs where a trader drones on about chart patterns. And without personal support and advice, they quickly give up. They want the money that trading can give - but without all the stress, work and anxiety which often goes with trading. Guess what? That’s what the Millionaire Trader Protégé Programme Offers! I can teach it to you from the comfort of your own home thanks to the power of online video, so you don’t need to attend a seminar, however to make 100% sure that you understand my trading system I will fly to the UK were we can get together and spend an afternoon together where we can have a great sit down lunch (I am paying) and I can go through any questions you may have and share some of my exact trades. Just to clear you don’t need to attend and it will not cost you any extra. In fact, I will even set up a Live Trading Virtual Account for you. So as you go through my course, you can try out my Internet Financial Trading System WITHOUT risking a penny! And you’ll be able to PROVE to yourself how easy it is (more on this in a moment). Watch live on screen, following my instructions, and see what kind of income you can make. So please DON’T think this is only something I can do. Indeed, I think it’s VERY IMPORTANT before you read any further, that you realise that I myself am NOT some financial whiz-kid … far from it. I really am a fairly ordinary bloke of average intelligence who never even went to college, let alone university. In fact, I left school at the age of just 16 to work as a junior at Nat West … and if I recall, earned just £100 a week for a 12 hour working day. I built up from nothing and I am sure you are in a better position than I was when I started. 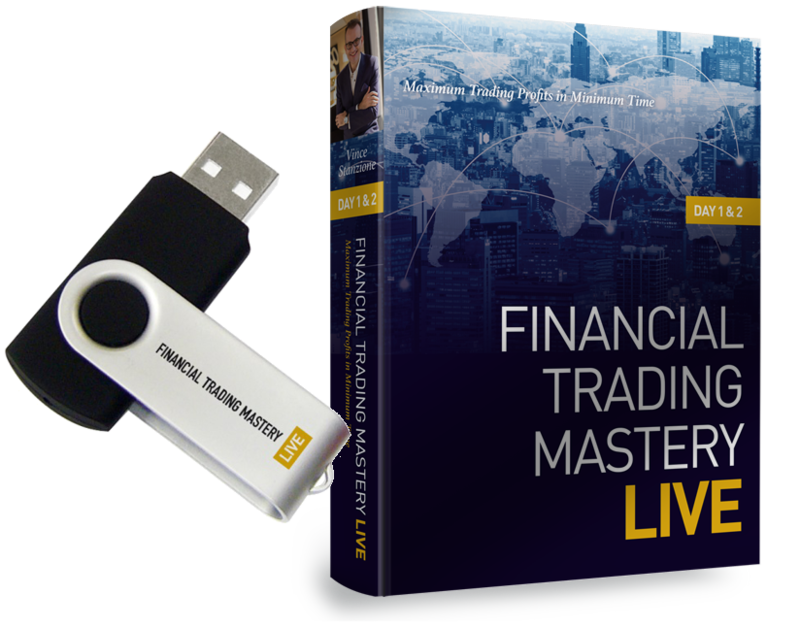 You DON’T need any previous financial trading experience – as you’ll soon see, I’ve shown my trading secrets to people who didn’t even know what financial trading was... and those same people are now living dream lifestyles as “moneyed-up” financial traders. 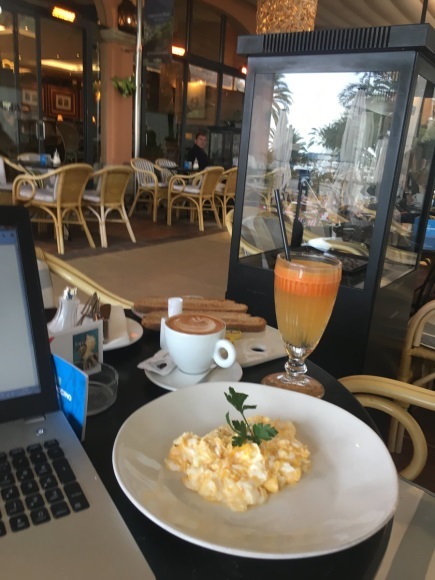 You DON’T need any special (or expensive) equipment – my “office” is wherever I am and my laptop computer or iPad. As long as you can access the Internet, you don’t need any other equipment. You DON’T need a lot of time – remember it takes just 20 to 30 minutes a day (tops!) to log onto the Internet and press a few buttons on your laptop or palm held computer to make £1,000 £3,000, £5,000, £10,000+ a week. And those 20 to 30 minutes can be at any time, day or night. Whenever suits you best. We are not day traders watching screens for 14 hours a day! Here is a screen grab of my IG Index account from my iPad and that was an extra £20,000 I banked whilst on holiday in Las Vegas at the Wynn and Bellagio over Christmas using the exact technique I will show you. You DON’T ever have to bury your head in trading charts… intra-day graphs… financial analysis… or any other kind of boring spread sheet financial data. The Less Experience You Have Of Financial Trading… The Easier It Will Be For You To Make Money and less time you spend the more you make. In fact 4 hours a week should be the maximum time you spend doing this. That sounds wrong, doesn’t it? But hear me out on this as I explain the reason why my students and I have had such great success in the last few years whilst others have had financial famine. You’ve heard of the legendary martial art fighter Bruce Lee, right? Bruce Lee is of course remembered (even worshipped) as the best “human fighting machine” the world has ever known. He Routinely “Wiped The Floor” With Opponents Twice His Size And Weight. Even when he was up against multiple opponents. So Bruce Lee came up with his own unique fighting “system” (JeetKune Do) that combined the-best-of-the-best fighting techniques, from 26 different styles of human combat fighting. 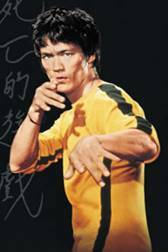 And so whatever kind of punch or kick an opponent threw at him – Bruce Lee was instantly able to “neutralise” it and unleash a “game over” fight move (or moves) back. Okay, but what has this got to do with you making money from the financial markets? Especially in today’s extremely volatile markets – where the financial markets lash out at you with all kinds of vicious “kicks” and “punches” (metaphorically speaking, of course!). This is what the “Bruce Lee secret” is all about – having multiple options in your “trading attack”. After all, it always makes sense to have multiple options “up your sleeve”, whatever you do. But in today’s extremely volatile financial markets it’s not just important to have multiple options… it’s critical. Anyway this is where I’ve got you covered. Likewise, if share, commodities and currencies are all dropping in price like rocks off a cliff... I’ll show you how to profit from trading on a downward trend in the markets. You will always be able to “Roll” with whatever the turbulent Markets throw at you & make money regardless. That’s not to say you’ll never lose money. That would be stupid to expect. If I had relied on just one (or two) styles of trading – there’s NO WAY I would now be sitting on a MULTI MILLION PROFIT over the last 3 years. Truth be known, I probably wouldn’t have even made 1/10th of that. Do you want to know a disturbing little secret? Own Trading System Talk about the blind-leading-the-blind. And the only way they can consistently make the kind of income they’d like you to think they make is by aggressively hawking their trading system onto a gullible public. How Does Someone With No Trading Experience Become A “Bruce Lee” Of The Financial Markets? How can someone (like you) “turn” whatever the financial markets “throw” at them into a profit? In a nutshell, it’s a chance for you to be “taken under my wing” and have exclusive access to ME as well as all my propriety trading strategies and resources. These are the exact same resources and trading strategies I have developed over the last 10 years and have used every day to make myself a stress free income. What kind of trading strategies am I talking about? It’s not. Not when you have the “one minute secret” codes and know exactly what “triggers” to look for. What’s crazy is sitting for hours on end with your head buried in reams of market research, financial data or those confusing intra-day graphs. Who has time to do all that these days? Of course you won’t have to worry about any of that “hard slog” research. At least you won’t, if you become a member of my protégé programme. But perhaps you’re wondering just how accurate the “one minute software” is. Well, get this: in less than one minute, I was “alerted” to a series of otherwise overlooked trades that went on to turn a £20,000 investment into well over £120,000 5 months later. In fact, some of these trades are still open as I write so the profits are still going up but do not copy them as I may have closed or even reversed the traders by the time you read this. All these trades where picked up using my trading system and in many cases, we bought the same stock multiple times. We also lock in profits so if and when these high flyers come back to earth (as many times they do), we have taken a big chunk of the profits. I concentrate on US listed stocks for the simple reason that the market is much bigger and spreads are tighter. Of course via the US market, we can also trade companies from all over the world that are US listed such as Chinese internet stock Baidu as well as 100’s of Exchange Traded Funds which track markets including Singapore, Switzerland, Indonesia, China, Japan and Brazil, to name a few. Whilst we trade some UK and European markets, they are just too small. It makes sense to go for the low hanging fruit, yet every day I see many new traders (and some experienced ones) commit financial suicide trading markets which are just too difficult to make money in. The good news for you is you have me to guide you and stop you doing stupid things, as well as showing my members how to make money. I have saved my members millions and helped them avoid financial scams, while stopping them from buying financial products that are flawed from the outset. 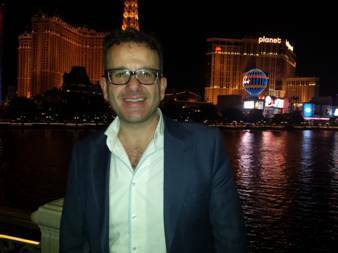 As a member of Vince Stanzione’s Platinum Protégé Programme, you will never “fall” for any of the bogus financial trading “black box robot” systems being flogged on the Internet. You’ll instantly be able to “see through them” for what they are – which means no more getting ripped off. 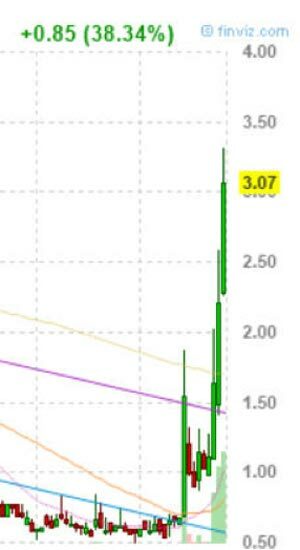 When you too have access to my proprietary trading systems, tools and resources – all you do is follow the “triggers” exactly as I will show you... and within just a few weeks at the outside you can be receiving a stress free income that could dwarf anything you make at a regular job or business. You can do it all without pressure... without strain... and without the horrendous overheads and “red tape” most business owners have to fight against on a daily basis. 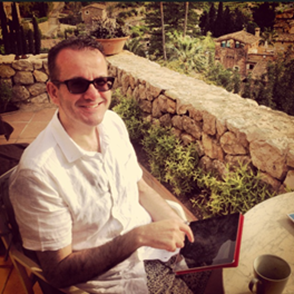 This is a photo of me “working” if that’s the right word from my local café in Mallorca. As a matter of fact, as a member of Vince Stanzione’s Platinum Protégé Programme – you won’t have to try to figure anything out. If you want, you can just blindly copy my trading “triggers” whilst you get started so you can earn whilst you learn. You Simply Can Not Find My Proprietary Trading Strategies Anywhere Else On Earth and get the support and insider know-how that I offer. 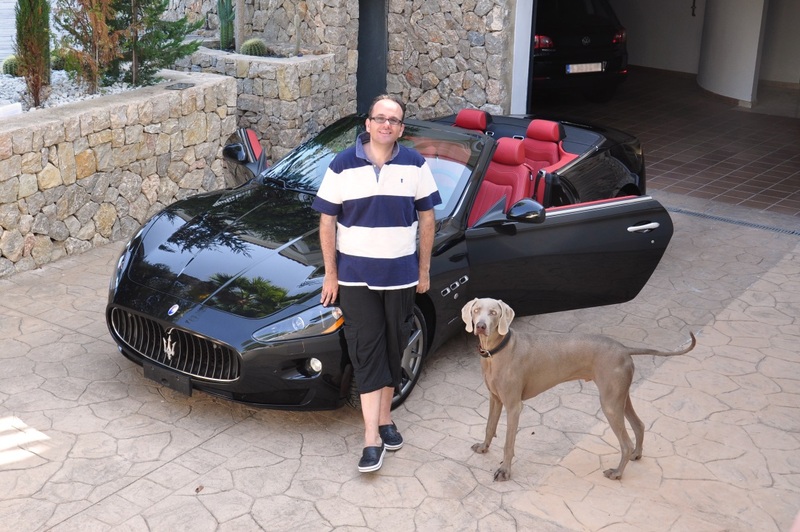 The ONLY way you’ll ever get all my trading secrets, systems and strategies is to register for Vince Stanzione’s Platinum Protégé Programme and working alongside me for the next 12 months. Okay, let’s quickly go over a few component parts of Vince Stanzione’s Platinum Protege Programme. Once you have signed up contact me and I will go through your current investments and suggest the best brokerage accounts and trading strategies to suit your capital and investment objectives. I can put you in touch with my direct contacts including the London office of the US broker that I have used for over 20 years who will fast track your application and help you with the forms required. 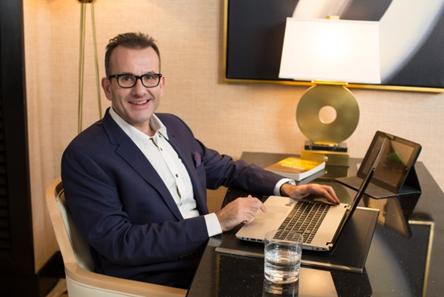 You will have my private e-mail (normally reserved for my high-paying corporate clients and closest business associates); and, for an entire 12-months you can e-mail me any time you have a question or you get a little stuck trading. I always reply to my e-mails. And, barring illness or being away in a remote area etc., I’ll reply to your e-mails within 24-hours and many times sooner. I don’t employ trading assistants or a call centre in Mumbai. 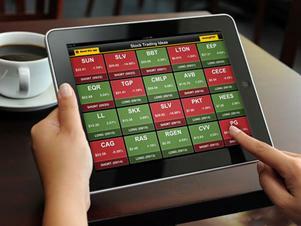 trade checker software which works on major stock indices, commodities, currencies, bonds, major UK and US shares. As a backup, if you have a trade which you’re unsure of, you can send me a message and I will double check it for you. By the way it works on any PC, MAC or even iPhone/iPad and needs no installation, downloading updates or setting up, as it works on our servers. You can log in via a secure site and you can use it from anywhere in the world. 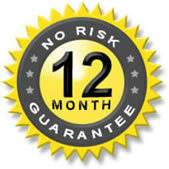 After the 12 months, you can carry on using this for just the nominal support fee. You will get access to my private website (exactly the same one I use) which is password protected – and is an “online inner sanctum” where I’ll reveal my up-to-date trading analysis... commentary on the thinking behind the analysis... and... even the exact trades I myself will be making. 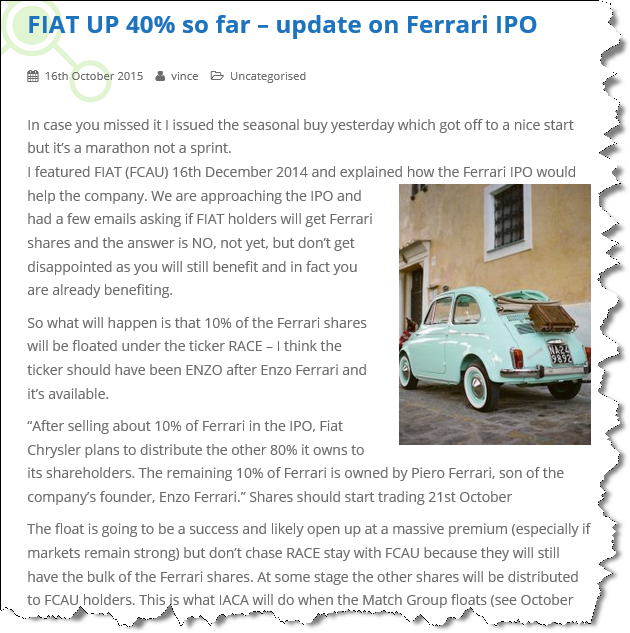 For example I showed all my members how to buy FIAT (FCAU) shares and get free Ferrari (RACE) shares. Ferrari shares are up over 50% so far in 2017. So you’ll see exactly when I place my trade (and why) as well as exactly when I get out of my trade (and why). Of course not every trade you “blindly” copy will make you money. That would be impossible. 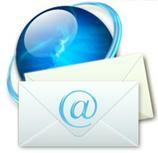 You will have access to every message I have posted and every copy of my monthly newsletter from December 2006. This acts as a great library and resource; of course you can also check out how accurate I have been. And on the subject of trades here are some of my 2015 - 2017 trades, these are real money trades. As it’s not fair to my current member to show all the details, I have cut off the names but you can see the actual profits each trade made. Trades marked with SP are short trades so I profited from falling prices. I will set up a virtual trading account so you can place virtual stock, options and Exchange Traded Funds deals for those that require spread betting. It’s very easy to use. Easier than ordering a book from Amazon. There’s nobody you need to phone up and talk to... and... you can trade from your computer (or laptop... or even palm held computer) any time, day or night. You don’t even need to risk any real money right away. This way, you’ll be a lot more confident when you trade with real money on the line. Here is a screen grab of my new Sharescope settings. I have been working on this for around 12 months. All the programing has been done for you so those buy and sell arrows will appear automatically. I will also show you how to use this for shorter term trading as well and it works on Shares, FX and Commodities. If you can follow a UP and DOWN arrow then you can follow this. Just to be clear with this plug in you will know exactly when to buy and sell which totally removes the stress and guess work out of entering and more importantly exiting a trade. I will give you my exact sharescope scripts filters so you will see exactly what I see. You Will Be Rush Shipped A USB Stick with the videos of my full 2-day seminar over 12 hours of footage in total in 8 easy 1 hour 30 minute sessions. These were professionally filmed in HD to make sure you can see every detail clearly. You can watch these at your own pace on your computer, iPad or even phone. You will also receive my full printed workbook and PDF versions of everything I show. I will show trades that you can place which can make gains of between 20% and 50%+ in less than 48 hours. These trades can help grow your capital exponentially as profits can be rolled from one trade to another. If you compound some of the returns then the numbers can be staggering. 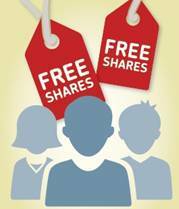 I’ll also show you how to build up a portfolio of shares that have cost you ZERO and I will show you mine. 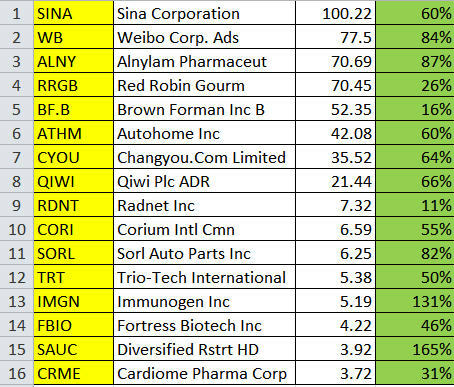 These trades are ideal for smaller accounts as many of the shares are trading at less than $5. 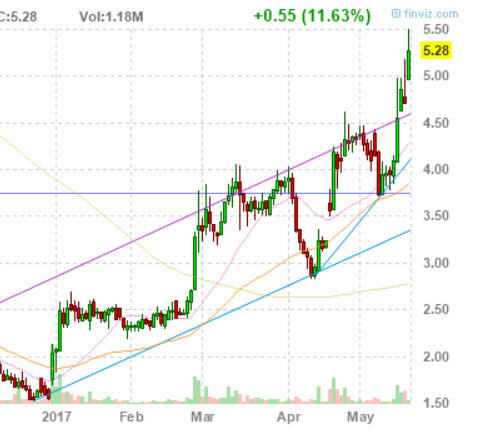 Here is another small biotech company that is up around 300% and still have potential. It’s gone from $1.50 to just under $6. A few trades like these will really help your account grow. 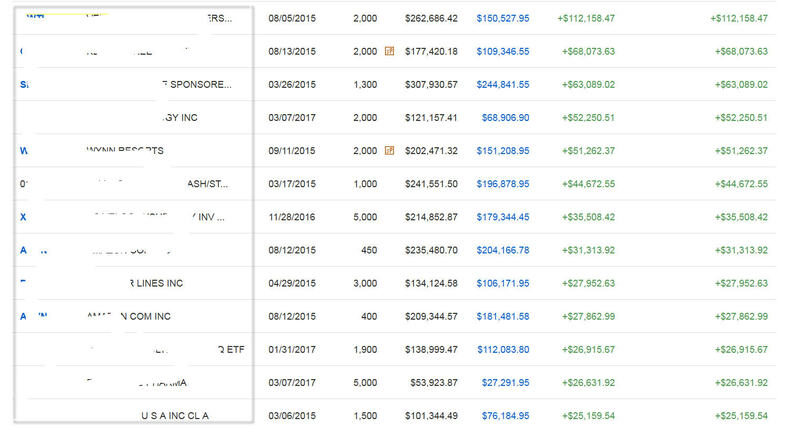 Right now many US companies are boosting their share price using this accountancy trick, I will show you how to identify those stocks and I will also show you an Exchange Traded Fund that invests in these companies. As you will know over the last few years I have been bullish and made most of my money from stocks going up, however, do not think for one minute that I have bought into the fact that everything is rosy in the world - I have not. 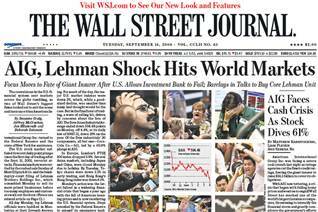 Remember I am the person that made serious money from the 2007/2008 meltdown such as Northern Rock, Bear Sterns and Lehman Brothers and have no problems trading through market crashes and a major crisis. We have already seen big moves in currencies and commodities, at some stage a 15% to 20% correction in US stock markets is going to happen but just like we did in 2007/2008 we can profit from these moves. I will be going through some of the risks I see as will my guests and how to protect and profit from these moves. Financial Spread Betting is a very misunderstood trading vehicle and I will spell out to you in easy language how I use spread betting and how I compounded my gains. This same system still works today and it’s the exact way I have made over 1 million US$ profit in Amazon in just over 24 months. I will also share with you inside information the Financial Brokers don’t want you to know and how to turn this information to your advantage. Let’s face it humans are just not very good at trading and most make the same mistakes over and over and allow human behaviour to get in the way of making money, however, by identifying these weaknesses and emotions I will show you how you can profit. I will show you how to cut the emotions out of your trading. You will make more money, spending less time with a lot less stress by using these secrets. As I stated earlier one of my accounts which started with just under US$1 million now has a value of over US$16 million which I am sure you will agree is a great return in less than 12 years but what is also fascinating is that I have made large gains from shares that I never purchased yet were magically credited into my account legally. I will show you exactly how to do this. 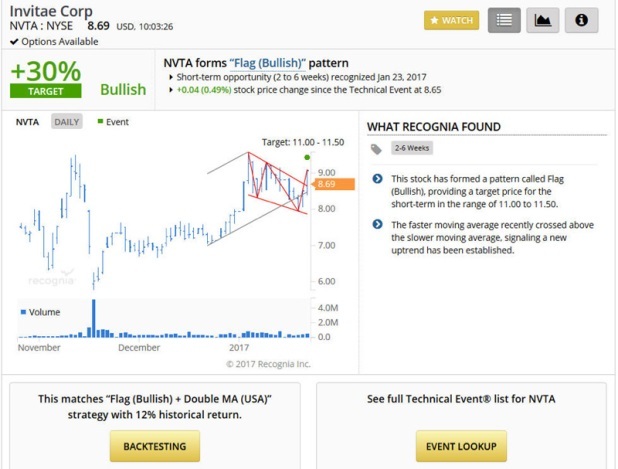 One of the biggest changes in the last 15 years has to be the way trading software can filter out opportunities and recognise patterns, which until fairly recently was unheard of and had to be done manually. I’ll go through some of my favourite tools and will show you how to access them as well as showing you my plug-ins for Sharescope. Sharescope still remains one of my favourite software packages and I have plugins which allow you copy my exact settings cutting out the setup time. I will also show you some new web-based tools which have made it much easier to find opportunities. And I will show you a lot more including updating you on my favourite investments. How to use “automatic sniffer dog” software to track where the real players in the markets are putting their money! How to make money from commodities if their price goes up... and down! 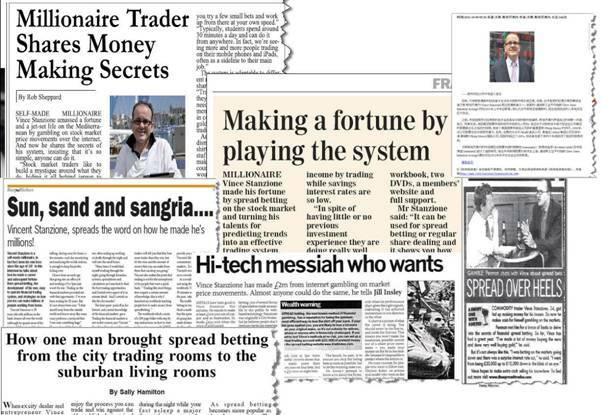 The closely guarded secrets of the world’s most ruthless (and cunning) multi-millionaire traders! How to beat-out 95% of the “big dog” Wall Street experts... and cash in like crazy! And because I want you to have every opportunity to succeed, I will also include three extra special bonuses which are not available anywhere else. Jim Mellon is an Entrepreneur and fund manager. 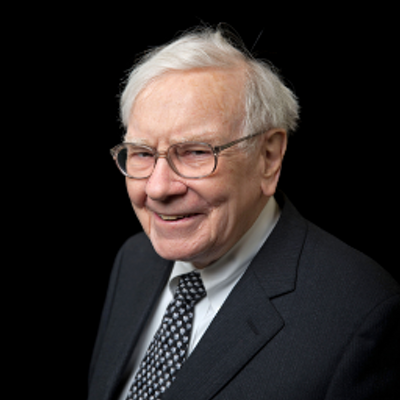 He is ranked 110th in The Sunday Times Rich List 2014 with a net worth of £800m. He made his fortune in the emerging markets in the 1990s. In 2005, he cofounded uranium miner UraMin with Stephen Dattels, with $100,000. It floated on Aim in 2006 and was acquired by Areva for €1.8bn a year later. 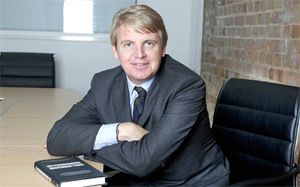 Educated at Ampleforth, Jim Mellon read philosophy, politics and economics at Oxford before working in Asia and the US. 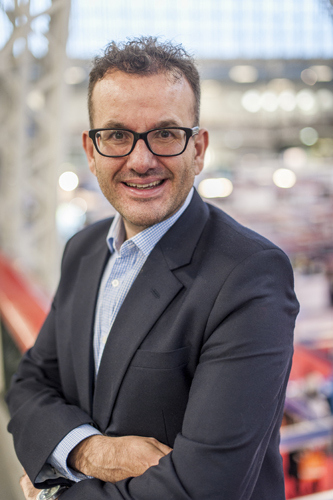 He is the author, with Al Chalabi, of several books – including Cracking the Code, which outlines investment opportunities in biopharma. Jim is a true visionary and has a knack of investing in the next big thing; he gives some great ideas in his presentation on his big investment theme for the next few years and how you too can profit from it. Jeff is editor-in-chief of the Stock Trader’s Almanac, Seasonal Sector Trades, and the Almanac Investor eNewsletter. 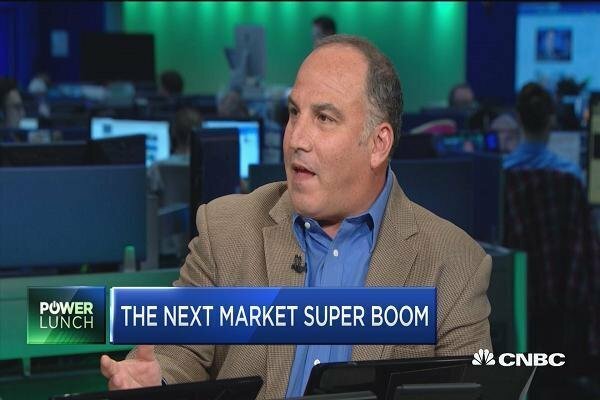 He is the author of The Little Book of Stock Market Cycles (Wiley, 2012) and Super Boom: Why the Dow Will Hit 38,820 and How You Can Profit from It (Wiley, 2011). 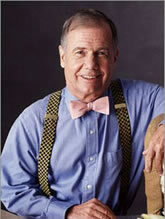 A 25-year Wall Street veteran he took over from founder Yale Hirsch in 2001. 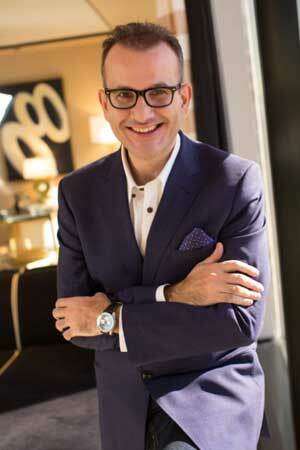 Mr. Hirsch regularly appears on CNBC, Bloomberg, Fox Business, BNN, Yahoo Finance and many other financial media outlets. A devout market historian, old school market technician and fundamental analyst, Jeff uncovers ripe trading and investment opportunities by zeroing in on securities where all three disciplines line up. You will get his full 1 hour presentation and accompanying notes. Chris Chillingworth is an Entrepreneur, Investor, Blogger, Podcaster, Presenter, Trader, Coach and father of three. Chris bought my “Making Money From Financial Spread Trading” course back in 2011 when he was still working for a company. Fed up of making other people rich at a handful of different companies he worked for, he began a journey into Entrepreneurism in 2011, and he quit his full-time job as an Operations Manager working in the Insurance industry. 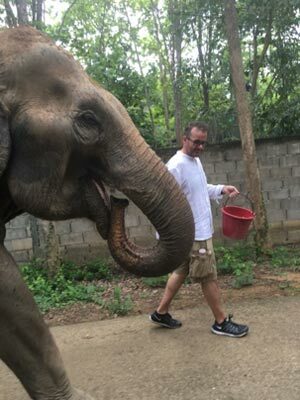 He’s also a volunteer part-time sports coach for an American Football Team. 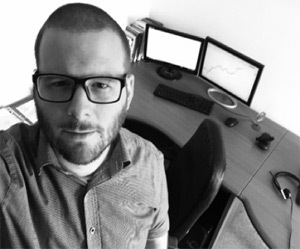 Chris has gone on to run a very successful website, and developed some excellent trading tools including Swing Trading systems which were based on my own rules. He trades a mixture of longer term and short term systems and has done very well with the German DAX index. Chris shares some great information on his journey from office cubical to freedom. Chris is also a big student of psychology and will be sharing the big difference he found between winning and losing spread-betting traders. 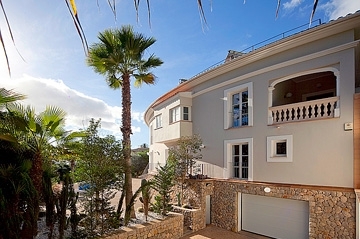 Maybe you’ll buy a top-of-the-line sports car... maybe you’ll move into a luxury 5-bedroom house with swimming pool and tennis courts... or... perhaps (like me) you’ll choose to spend most of the year soaking up the sun around the Mediterranean. It’ll be entirely up to you. After all, when you’re pulling in £1,000, £3,000, £5,000 + every week, you don’t need to work a job or have your life dictated to by other people. You’ll Have TOTAL FREEDOM To Do Exactly What You Want There’s no rush, either. Because when you make your money as a “lone wolf” financial trader, you wake up when you want. It doesn’t matter if you get up at 11 o’clock in the morning. You choose. 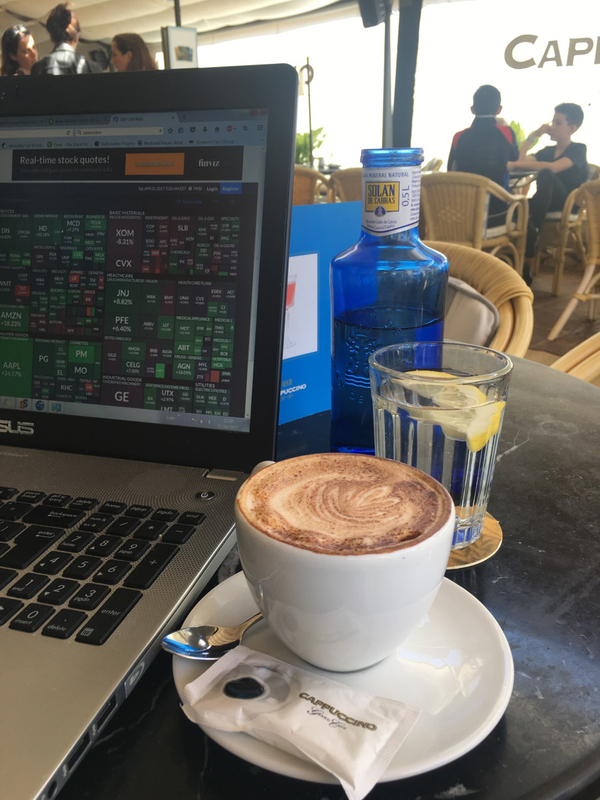 You may even choose to take your laptop to a coffee shop... relax into a comfy chair... sip your coffee... and “take care” of your trading business in less time than it takes to finish your coffee. Then you can read the newspaper at your leisure. And the rest of the time is yours to do as you please. Maybe you’ll play golf... or tennis... or go to the gym. Maybe you’ll take up a hobby or interest you’ve just never got round to – like maybe painting… or writing… or sailing… or flying lessons… or whatever. Again, you choose. 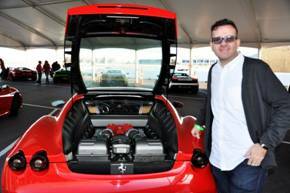 What about going to a track day racing super cars? 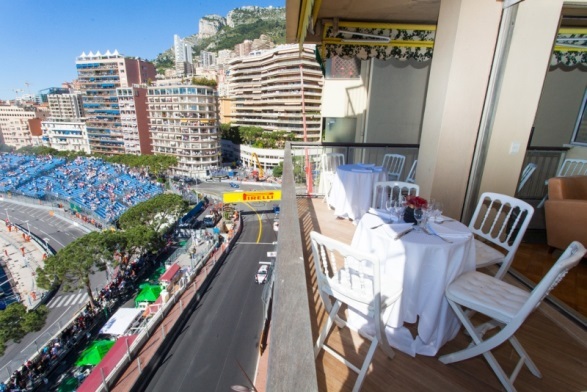 What about going to the Monaco Grand Prix in VIP style? 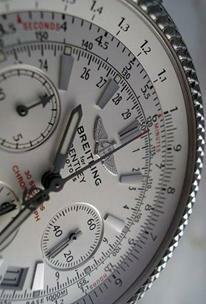 Money and time will no longer be of concern to you. And when people see you driving around in your brand new fancy car... or hear about all the exotic places you’re either just coming back from or going to... they’re going to want to know what you’re doing. Tell them you trade the financial markets. You’ll get instant respect and admiration. While doing a fraction of the work they do. Then watch their jaw drop. It will be a moment to savour. Well, for starters, there are 4 strict conditions you must meet before I will even consider mentoring you. CONDITION 1: You must agree not to “leak” any of the proprietary trading information I will be sharing, even if you get bribed by another so-called trading “guru”. Doing so will result in severe legal action. You must also agree that this information is for your personal account only, no reselling or using the information for friends, family or your own clients, if you want that then contact me about my corporate account arrangements. CONDITION 2: You must have at least £5,000 (US$6,500) to trade with. Definitely Do NOT Attempt To Sign-Up For My Protégé Programme. CONDITION 3: You must commit to my protégé programme for the full 12-months. In other words, if you have any doubts whatsoever whether or not I am the right person to mentor you… or… you have concerns over whether or not the protégé programme is right for you… then... again... please do not attempt to sign-up. I’m not joking. It’s a 12 month minimum commitment; if you’re not committed or entirely serious, please don’t waste my time. If you’re the sort of person that cannot make a 12 month commitment or you’re going to get upset because you have a few losing trades then really, you’re not the right person for me to take on. CONDITION 4: You must be over 40 years of age otherwise you will need to prove to me you’re mature enough to do this. Whilst I will consider those that are under 40 years of age I really favour those that are over 40 and preferably over 50 – why? Well my style of trading is not day trading, looking at lots of flashing indicators. If you’re looking for excitement then go elsewhere. Trading and investing is a bit like driving a car; why are the premiums for young drivers so high? 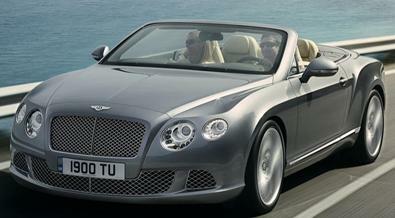 Why do many insurance companies favour over 50’s? I have found (and I have been teaching trades now for over 14 years) that the over 40’s and over 50’s have a maturity, patience and financial stability which has made them ideal students and have achieved excellent results. By the way my oldest member is 92. My youngest member is 28. I’m Almost Certain To Turn Away The Majority Of People Who Try To Sign-Up Why? Simple – only a strictly limited number of people will be accepted onto the programme. So you see? 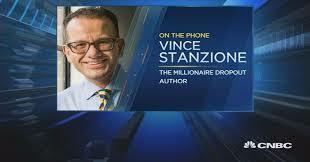 My Vince Stanzione Protégé Programme is not cheap. Well, since you could be making £1,000, £3,000, £5,000 + a week as a member of my protégé programme… there’s a very real chance you’ll be in profit to the tune of around £100,000 by the end of the 12-month programme. One of my current students David Cox made £124,550 in the first 3 months. And so I don’t think it’s unfair of me to charge £6,997 for a spot on my protégé programme. After all, you could realistically make back £6,997 (and more) inside the first few months of the programme. But then I remembered back to when I first started trading and there was no way I could have afforded £6,997 in one payment…. That’s how confident I am in the proprietary information, strategies and support I will be sharing with you in my protégé programme. I am working for YOU for £13 a day…. For just over £13 a day or the price of a cup of coffee and breakfast (if you’re lucky in most cafes), you have access to my 30 years of my know-how, my personal support, my trading tools, updates and my network of contacts, everything to put the odds in your favour and to make sure you’re in the small and elite First Class group of my clients. And because of my super-generous offer -- it’s almost certain more people are going to try to sign-up than there are places available. Think about it my results and track record are some of the best in the industry so you either “see” the value of what I’m offering you here, or you don’t. Let’s be honest if your serious about making money then £2,997 is really not a big investment considering that this could pay dividends for the rest of your life. If you want to fly economy and pay economy prices then really you do not need me. 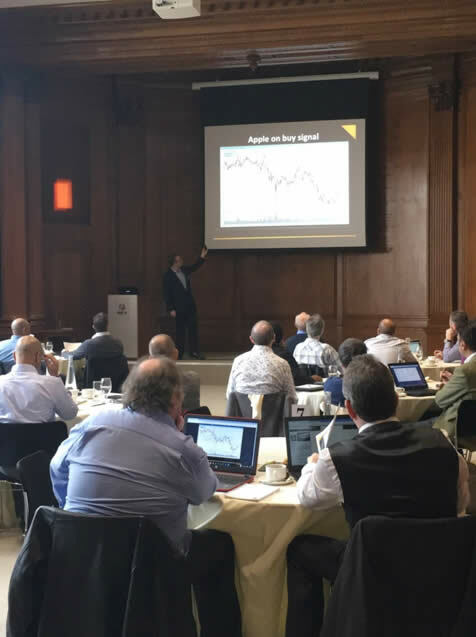 And just to be clear I am also including a place at my exclusive Financial Trading Lunch in London where we can get together and I will answer your questions and I share my up to date trading ideas at no cost. But you can’t dither about. Because of the intensive personal nature of my 12-month protégé programme, I’m only going to work with a very limited number of students and I am only in London a few days a year so the live lunch places are extremely limited. What that means is – if you want “in” on Vince Stanzione’s Platinum Protege Programme – you’ve got to act fast. Click on that link immediately if you’re serious about me personally mentoring you for the next 12-months in the strategies that have made me a personal fortune over the last 10 years. Wait even another minute and you may find that all the places have already been taken and you’ll miss out on your ONLY CHANCE to have me personally help you make £1,000, £3,000, £5,000+ per week. I Will Give You A Full Refund On Your Membership Fee & All Your Monthly Fees Paid. And you still get to KEEP the workshop videos USB (which cost people £4,997.00). In other words -- there is no way you can possibly lose with this offer. 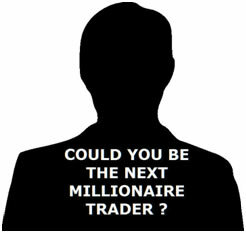 If you’re serious about me personally mentoring you in the strategies that have made me a person fortune over the last 10 years then go to www.millionairetrader.co.uk right now and reserve your place. All the comments used in this letter are 100% genuine letters or emails and comply with Section 14.1 of the Advertising Standards Authority code of conduct. “Very inspirational thank you. 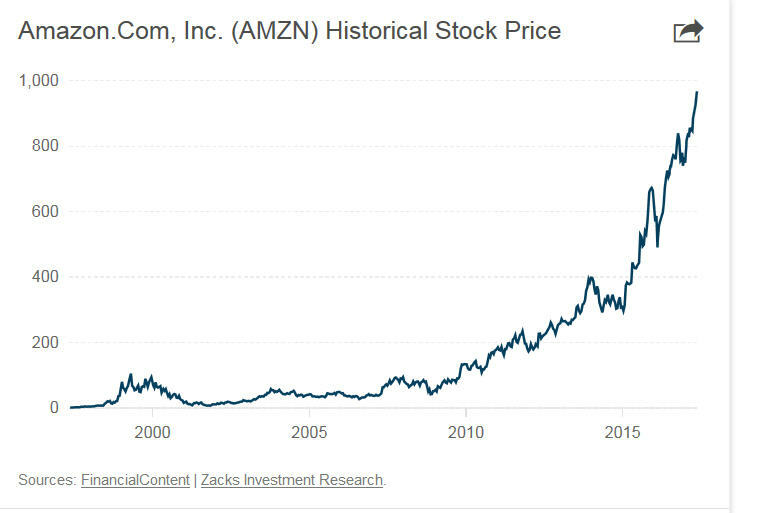 Thanks for the reminder that it’s the medium to long term where the money is. It’s so easy to forget that. “Vince’s training is focussed directly to the topics and very easy to grab by using several illustrations or examples. I have been trading through spread-betting already and with this current training, it’s like a refresher course and a build up upon what or the little I know. “I am a new trader. The concepts that I knew something about because of Vince’s previous explanations are now far more clear. I could go on, but I think you get the idea. It’s important to note that none of above had trading experience before they became my students; they all came from non-investing or trading backgrounds, but were involved in professions and being business owners such as vets, dentists, doctors, accountants, florist owner, London back cab driver, farmer, BA pilot, lawyers, and even a gentleman that owns a remote salmon fish farm. If you’re serious about me personally mentoring you in the strategies that have made me a person fortune over the last 10 years then click here right now and reserve your place. U.K. Government Required Disclaimer – You are reminded that the price of shares and the dividends thereon can go down as well as up. None of the following contents should be construed as an invitation to buy or sell securities or open spread betting positions, shares or any other financial trading product. Futures, CFD, Margined Foreign Exchange trading, Covered Warrants, Traded Options and Spread Betting carries a high level of risk to your capital. A key risk of leveraged trading is that if a position moves against you, the customer, you can incur additional liabilities far in excess of your initial margin deposit. Only speculate with money you can afford to lose. Futures, CFD, Margined Foreign Exchange trading and Spread Betting may not be suitable for all customers, therefore ensure you fully understand the risks involved and seek independent financial advice if necessary. Past performance is not necessarily a guide to future performance. 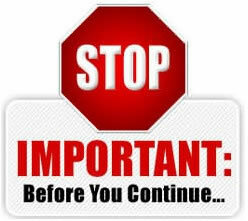 Any securities or financial products discussed are by way of example only and are not an invitation to buy or sell. Vince Stanzione, First Information and his agents may have a holding or open position on some of the financial markets discussed in this letter. By featuring specific cases or client testimonials on this site, we do not imply or guarantee that you will receive similar results. The earnings show in this letter are for indication only and factors such as starting capital and market conditions over the next 12 months will determine actual results. The program relies heavily on the skill and experience of Vince Stanzione, in the event of severe illness or his death it would be highly likely that the program would suffer adversely. Vince Stanzione and First Information are NOT regulated by the Financial Conduct Authority and do not give specific investment advice. U.S. Government Required Disclaimer - Commodity Futures Trading Commission. Futures and options trading have large potential rewards, but also large potential risk. You must be aware of the risks and be willing to accept them in order to invest in the futures and options markets. Don't trade with money you can't afford to lose. This website is neither a solicitation nor an offer to Buy/Sell futures or options. No representation is being made that any account will or is likely to achieve profits or losses similar to those discussed on this website. The past performance of any trading system or methodology is not necessarily indicative of future results.